Orange County Assessor Webster Guillory left office on Monday when Claude Parrish was sworn in to replace him after Parrish defeated Guillory 53%-47% in the November elections. Today, the preliminary hearing in Guillory’s felony case will begin. with Judge Elizabeth Macias determining if there is probable cause that Guillory committed the offenses he is charged with in order to decide whether or not the case will be allowed to proceed to trial. Knowing that he had not personally collected the signatures or witnessed them being written, Guillory is accused of signing his name on two of the 10-signature petitions collected by his associate under the affidavit that reads, “I circulated the petition and witnessed the signatures on this section of the nomination paper being written.” He is accused of requesting another colleague to falsely sign the third petition. He is charged with three counts of violating Elections Code Section 18203, which makes it crime for “Any person who files or submits for filing a nomination paper or declaration of candidacy knowing that it or any part of it has been made falsely…” The DA notes that if Guillory is convicted, the sentence can range from probation to up to four years and four months in jail. Guillory was originally arraigned on September 12 and plead not guilty on September 22. He then lost his bid for re-election on November 4. A pre-trial hearing was held on November 24, and of course, today is the preliminary hearing. Judge Macias was appointed to the Superior Court in 2012 by Governor Jerry Brown. Prior to her appointment to the bench, she was a Deputy Federal Public Defender for 13 years. The case is being prosecuted by Senior Deputy District Attorney Brock Zimmon. Zimmon’s previous high-profile prosecutions include the computer-hacking tutor at Corona Del Mar High School, the drug charges against the rescued hiker in Trabuco Canyon, an illegal bail bonds solicitation case, the man who got his personal fluids into a co-worker’s water bottle, the Sheriff’s deputy who was drunk in court while on trial for injuring a 78-year-old woman while driving under the influence of prescription drugs, the Seal Beach jail employee who accepted bribes from inmates, and the Fullerton Police Officer who destroyed an audio recorder that had taped his interactions with a drunk-driving suspect who committed suicide. Guillory’s defense attorney is John Barnett. Barnett’s previous high-profile cases include Officer Manuel Ramos acquitted in the Kelly Thomas case, Officer Ted Briseno acquitted in the Rodney King case, Kyle Nachreiner (a Gregory Haidl co-defendant) convicted of sexual assault , Officer Jeremy Morse acquitted in Inglewood, Lisa Peng who plead guilty to manslaughter after two hung juries and a tossed conviction when she was charged with killing her husband’s mistress and the mistress’s infant son, a Marine Corporal acquitted after three trials for double murder at a coin shop, and a Newport Beach teacher acquitted of charges of molesting four students. SANTA ANA – The Orange County District Attorney has charged Orange County Assessor Webster Guillory with filing false nomination papers in a re-election bid for County Assessor in the March 2014 Orange County primary election. Webster James Guillory, 70, Newport Beach, is charged with three felony counts of filing false nomination papers and faces a possible sentence ranging from probation up to four years and four months in jail if convicted. He is expected to be released on his own recognizance and arraigned Friday, Sept. 12, 2014, at 9:00 a.m. at the Central Justice Center, Santa Ana. The Department is to be determined. At the time of the incident, Guillory was the four-term elected County Assessor for the Orange County Office of the Assessor. To appear as an Assessor candidate on the ballot for a primary election, a person must file required paperwork, including nomination papers, with the Registrar of Voters by 5:00 p.m. on the filing deadline date. A nomination paper is a petition that can be signed by Orange County registered voters to support the candidacy of/nominate the candidate. Each petition page has space for 10 voter signatures. For the Office of Assessor, a candidate must submit 20 valid signatures of registered voters on nomination papers to qualify as a candidate and appear on the ballot. Nomination papers cannot legally be accepted by the Registrar of Voters unless an affidavit is signed at the end of each page by the signature collector stating that he/she personally circulated the nomination paper and witnessed the signatures being written. The signature collector does not need to be the candidate, but the actual signature collector must be the person to sign each affidavit. The filing deadline for the 2014 Orange County primary election was March 7, 2014, at 5:00 p.m.
On the afternoon of March 7, 2014, Guillory collected signatures on two petitions, nine on the first and two on the second. Guillory is accused of also receiving petitions circulated by his associate, who gathered and collected three full pages of 10 signatures each. Shortly before the end-of-day filing deadline, Guillory is accused of fraudulently filing the three nomination papers at the Registrar of Voters, knowing the information each contained about who had personally circulated the petitions and collected the signatures was untrue. The Orange County District Attorney’s Bureau of Investigation received a confidential complaint and investigated this case. Senior Deputy District Attorney Brock Zimmon of the Special Prosecutions Unit is prosecuting this case. 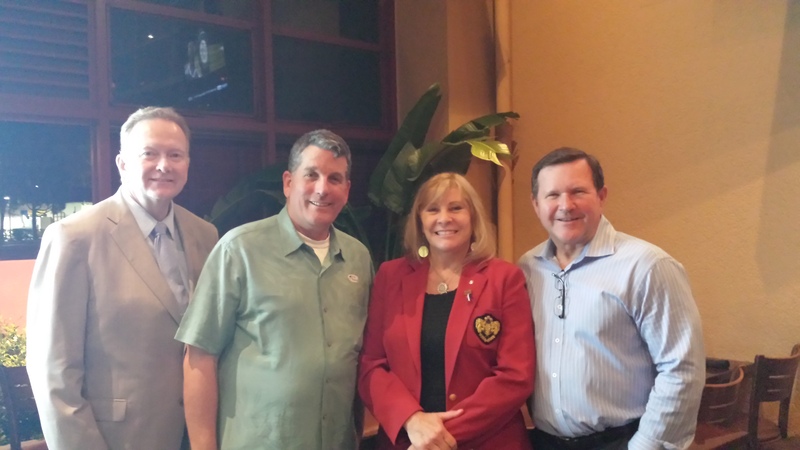 Auditor-Controller-Elect/Orange City Treasurer/Former OCBE Trustee Eric Woolery, OCBE Trustee Robert Hammond, Laguna Niguel Mayor/OCBE Trustee-Elect Linda Lindholm, and OCBE Trustee Ken Williams. Woolery achieved a historic margin of victory in his race for Auditor-Controller (story #6) while Lindholm knocked off Orange County’s longest-serving-in-a-single-office incumbent (story #5). AD-74: Keith Curry and Matt Harper Advance, Emanuel Patrascu Last – Emami called it, mostly. Thanks to Karina Onofre spoiling the Democratic vote for Anila Ali, we have an all-Republican battle for AD-74 to replace Assemblyman Allan Mansoor. Shockingly, Emanuel Patrascu who had the second most money in AD-74 came in fifth while Harper who spent next to nothing (and what he did spend focused on slate mailers) came in a comfortable second. This comes down to a Newport vs. Huntington battle in the November runoff, as Newport Beach Councilman Curry fights it out with Huntington Beach Mayor Harper for the Assembly seat. How much in Republican resources will be drained by the AD-74 race in November, as Republicans seek to capture SD-34 and AD-65 from the Democrats? AD-73: Bill Brough Wins GOP Nomination, Anna Bryson Last – In this safe Republican seat, Bill Brough’s low-budget operation demonstrated that precinct walking does work for winning open seats. With Democrat Wendy Gabriella advancing to the runoff with Brough, he is the prohibitive favorite to be the next Assemblymember from the 73rd District and the district’s first Assemblyman in 16 years after Assemblywomen Patricia Bates, Mimi Walters, and Diane Harkey. Depending on completion of vote counts for absentees and provisionals, Anna Bryson’s IE-laden campaign may have cost well over $100 per vote. (To put the massive IE spending for Bryson in perspective, here’s how much spending would have been needed for several other candidates in other races to match that rate: Michelle Steel would have needed $2.4 million, Linda Lindholm $3.1 million, and Eric Woolery $11.0 million.) This race clearly demonstrated: money can’t buy everything. AD-55: Ling-Ling Chang Captures Top Spot – In a brutal slugfest between Diamond Bar Councilwoman Ling-Ling Chang and Walnut Valley Unified School District Trustee Phillip Chen with Diamond Bar Councilman Steve Tye threatening to play spoiler, well-funded Chang managed to overcome very-well-funded Chen’s financial advantage to capture the top spot with 28% of the vote, pushing Chen into third place with 23% of the vote and Tye with 22% of the vote. Democrat Gregg Fritchle came in second with 28% of the vote. In this safe Republican district, Chang is the prohibitive favorite to be the next Assemblymember from the 55th District, replacing Curt Hagman. Irvine Unified School District: Ira Glasky Renders Special Election Moot, Beats Agran-Backed Candidate – After IUSD Trustee Gavin Huntley-Fenner resigned due to business and family obligations, the IUSD Board appointed Ira Glasky to fill the seat in November 2013. Utilizing an obscure section of the Education Code, a petition drive gathered the necessary 1,643 signatures (1.5% of registered voters at the 2012 school board election) to invalidate Glasky’s appointment and force a special election. The special election cost IUSD schools hundreds of thousands of taxpayer dollars. Three candidates filed to run: Glasky, Larry Agran-backed Carolyn Inmon, and Bob Vu. Glasky won 42% of the vote to Inmon’s 37% and Vu’s 22%. IUSD was forced to spend hundreds of thousands of taxpayer dollars on a special election that had the same end result as if the special election had never happened. Assessor: Webster Guillory vs. Claude Parrish Runoff – In 2010, Webster Guillory won 53% of the vote to Claude Parrish’s 47%, but Parrish ran as “Businessman/Tax Consultant” in 2010. Parrish is “Taxpayer Advocate/Businessman” this year. Last night, Guillory won 47% to Parrish’s 43%, with Jorge Lopez getting 10%. Parrish’s stronger ballot designation narrowed the margin between Guillory and Parrish. In Guillory’s favor is the fact that November voters are more favorable to incumbents than June voters. In Parrish’s favor is the fact that he has a stronger ballot designation in 2014 than he did in 2010. Also in Parrish’s favor is the investigation around whether or not Guillory’s nomination papers were signed by his subordinates at the office on County time; if this garners more publicity it helps Parrish; if it fizzles, it’s moot. Supe-5: Robert Ming vs. Lisa Bartlett Runoff – The narrative in this race always had business interests spending on IEs for Mission Viejo Councilman Frank Ury to put him into the runoff for the Fifth District Supervisor’s race. The conventional wisdom was wrong, as Laguna Niguel Councilman Robert Ming and Dana Point Mayor Lisa Bartlett each achieved 29% of the vote (Ming ahead of Bartlett by 0.4%), with Ury in third at 24% and Deputy District Attorney Joe Williams last at 18%. Supe-2: Steel Beats Mansoor 2-1 as Both Make Runoff – Conventional wisdom held that the Second District Supervisor’s race would result in a runoff between Board of Equalization Member Michelle Steel and Assemblyman Allan Mansoor. What wasn’t expected was just how close to 50% Steel would get or how large her margin over Mansoor would be. Surpassing most expectations, Steel pulled off 47% of the vote to Mansoor’s 24%, with Coast Community College District Trustee Jim Moreno at 22% and Huntington Beach Councilman Joe Carchio at 8%. Honorable Mention #1 – CD-45: Raths Falls Short, Jockeying Begins for SD-37 and Even AD-68 – Republican Retired Marine Colonel Greg Raths fell 4% short of overtaking Democrat Educator/Businessman Drew Leavens to advance to the general election with Republican Senator Mimi Walters. Did Walters’s hit piece (calling Raths a “Bill Clinton Republican” for his assignment to the Clinton White House while serving in the Marine Corps) move the needle 4%? Jockeying for the special election for Walters’s SD-37 seat and even Assemblyman Don Wagner’s AD-68 seat has already begun since Walters is expected to crush Leavens in CD-45 in November. Honorable Mention #2 – Shawn Nelson: OC’s Biggest Supervisorial Landslide Ever? With 84% of the vote, Supervisor Shawn Nelson’s reelection bid may well be the most lopsided victory ever achieved by an Orange County supervisor (excluding races where a Supervisor was unopposed or a Supervisor’s only opponent was a write-in candidate). Honorable Mention #3 – Measure A: OC’s Biggest Landslide Ever? – With 88% of voters in casting ballots in favor of Measure A, the measure may well have achieved the highest percentage ever for a ballot measure in Orange County. In the interest of full disclosure, clients of Custom Campaigns (the consulting firm that owns OC Political) include four IUSD Trustees (story #7: Ira Glasky, Paul Bokota, Lauren Brooks, and Michael Parham), three OCBE Trustees (story #5: Linda Lindholm, Robert Hammond, and Ken Williams), Eric Woolery (story #6), and Robert Ming (story #9). Separate and apart from the consulting firm that owns OC Political, this blogger also did the staff work for Measure A (honorable mention #3). One of our most popular posts from the November 2012 General Election was “Humongous Grid of Endorsements,” so we’re back this election with the Giant Grid of Endorsements for the June 2014 Primary Election. I did abbreviate for some groups, so OC GOP = Republican Party of Orange County, DPOC = Democratic Party of Orange County, CRA = California Republican Assembly, HJTA = Howard Jarvis Taxpayers Association, CWLA = California Women’s Leadership Association, OC Tax = Orange County Taxpayers Association, OCBC = Orange County Business Council, and CTA = California Teachers Association. Candidates in each race are listed in alphabetical order by last name, except incumbents got listed first in their respective races. Party affiliations are listed except for judicial candidates Thomas Martin and Wayne Philips, as I could not tell their affiliation from the voter database (common names combined with obscure judicial races make figuring out their affiliations challenging). *The Democratic Party of Orange County did not endorse David Boyd or Elizabeth Parker, instead the DPOC issued anti-endorsements against Tom Pollitt and Linda Lindholm. Voter registration heavily favors Republicans in Orange County as a whole, Republicans have 42% of registered voters, Democrats have 31% of registered voters, and No Party Preference voters count for 22% of the electorate. Even though party affiliations matter very little in these races because they do not appear on the ballot we will fill in readers on what they are; Claude Parrish is a Republican, Jorge Lopez is a Democrat, and Webster Guillory is an NPP voter. Also, it is important to explain that this race is just like a race for Orange County Supervisor where the top two vote getters will advance to November, unless the top vote getter finishes with over 50% of the vote. Claude Parrish is the predecessor to Michelle Steel on the State Board of Equalization and he has huge name ID. He ran for this office four years ago and came fairly close to upsetting Webster Guillory and I would argue that Parrish has a stronger ballot designation this time around. Let’s take a look at his electoral history. As you can see Parrish has some strong name ID over the past ten years. I will also point out that Parrish is the king of slates having bought up almost every major slate mailer that exists. Parrish has loaned his campaign $100,000 and donated an additional $170,000 and appears willing to spend whatever is necessary to win this race. He has a almost all of the slate mailers, has the most campaign signs, and has run an excellent campaign so far. With a low turnout election projected it bodes very well for a challenger who is running a strong campaign because the voters are more informed and will likely take the time to read about the race and the OC Register endorsement of Parrish a very valuable one. Based on the factors above, I like his chances. Webster Guillory is the incumbent and his been in this office for a very long time. As you can see from the election results, Guillory has a track record of getting elected to this seat, but I notice that he is trending downwards in terms of the percentage of the vote that he is receiving. With turnout at a ridiculously slow pace so far this climate may not be the best for an incumbent due to a more conservative electorate likely to turnout. Guillory has done little campaigning outside of the ballot statement and has not even filled out the paperwork that shows he is planning to spend more than $1,000. With the lack of mail and other campaign materials he appears to be relying on just his name ID to try and advance to the November run-off. With three candidates in the race it would appear that Guillory has an excellent chance to advance but not win outright due to the anti-incumbent vote being split. Guillory has received a little bit of press due to opponent Jorge Lopez complaining about how he gathered a majority of his signatures from county employees that work within his office. Jorge O. Lopez is on the ballot but he has done no real campaigning for the seat through voter contact. Unfortunately, he did not even get a ballot statement thus making it almost impossible for voters to figure out who he is and where he stands on the issues. Lopez will likely play the role of spoiler though because his candidacy will likely gain enough votes to send this race to a November run-off thus making it more likely that Guillory can hold onto the seat. There have been five lawsuits related to the June Primary election ballot for Orange County. The meat of this article is after the bullet list. The bullet list just recaps the prior cases. In the Second Supervisorial District, Allan Mansoor successfully sued the Registrar of Voters to change Michelle Steel‘s ballot designation of “Taxpayer Advocate/Businesswoman” and she is now required to use “Board of Equalization Member” instead. This case was covered here on OC Political, in an article in the OC Register, and in an article in the Daily Pilot. In the Clerk-Recorder’s race, Troy Edgar‘s lawsuit against the Registrar of Voters to get on the ballot was rejected by the Orange County Superior Court. Edgar’s lawsuit against the Registrar of Voters also sought to toss Assessor Webster Guillory and Superintendent of Schools Al Mijares from the ballot, and this effort was also rejected by the Superior Court. Consequently, Edgar fails to make the ballot while Guillory and Mijares stay on the ballot. Here’s OC Political’s coverage, including the only online copy of the full text of the judge’s ruling. The judge’s sweeping ruling used “failed” or “fails” six times in reference to Edgar and even uses “without merit” in reference to one of Edgar’s arguments. In the 73rd Assembly District, Mission Viejo resident Dale Tyler sued the Secretary of State to challenge a sentence in AD-73 Candidate Anna Bryson‘s ballot statement, “On the school board, I returned $59 million to taxpayers.” Tyler sought to have the sentence struck entirely, but the Sacramento County Superior Court judge issued a compromise, so it now reads, “On the school board, I voted to save taxpayers approximately $59 million.” Here’s OC Political’s coverage, and here’s the text of the judge’s ruling. In the Auditor-Controller’s race, candidate John Wayne Willard sued the Registrar of Voters in an unsuccessful effort to challenge Eric Woolery‘s “Orange Treasurer/CPA” ballot designation. Consequently, Woolery remains “Orange Treasurer/CPA” on the ballot. Here’s OC Political’s coverage, including the only online copy of the full text of the judge’s ruling. When the judge includes strong language along the lines of “The evidence is undisputed that Woolery was appointed to the position of Treasurer…” you know it’s a sweeping ruling. Oddly, the fifth lawsuit has yet to have any coverage anywhere despite being the first case to be completed, having been resolved way back on Tuesday, and it’s also likely the most significant case in terms of impact on a race. That case will be the focus of this article. Auditor-Controller Candidates Eric Woolery, John Wayne Willard, Frank Davies, and Mike “Mike” Dalati. OC Political was unable to find a photo of James T. Benuzzi. Laguna Niguel resident Todd Nugent challenged the ballot designation of Auditor-Controller candidate Frank Davies. Davies requested the ballot designation of “Deputy Auditor-Controller” for his bid for Auditor-Controller. Nugent challenged it on the grounds that this was an effort by Davies to game the system by playing working title musical chairs, as he was not the Chief Deputy Auditor-Controller. Denise Steckler held both the job classification and working title of “Chief Deputy Auditor-Controller” before the candidate filing period. Frank Davies held the job classification of “Administrative Manager III” and the working title of “Director, Property Tax” during that time. Then in the middle of candidate filing, after Davies had pulled papers for Auditor-Controller and shortly before he filed them, all four Directors at the Administrative Manager III level in the Auditor-Controller’s office had their working titles switched from “Director” to “Chief Deputy Auditor-Controller” instead (while still remaining in the job classification of “Administrative Manager III”). Chief Deputy Auditor-Controller Denise Steckler then switched to the working title of “Chief of Staff” (while still remaining in the job classification of “Chief Deputy Auditor-Controller”). Nugent filed suit in Superior Court and succeeded in having “Deputy Auditor-Controller” dumped as Davies’s ballot designation. Consequently, Davies is now “Property Tax Director” on the ballot. In an obscure down-ticket race like Auditor-Controller, having a ballot designation of “Deputy Auditor-Controller” would have made Davies the frontrunner. Nugent’s challenge was critical in putting Orange Treasurer/CPA Eric Woolery back in the driver’s seat for the Auditor-Controller’s seat. Defeating Willard’s challenge was also critical for Woolery’s frontrunner position. The three strongest ballot designations belong to Woolery, Benuzzi, and Dalati while the two weakest ballot designations belong to Willard and Davies. However, Benuzzi and Dalati failed to obtain ballot statements. Woolery is the only one of the five to wield both a ballot statement and a good ballot designation. Woolery also bought up most of the slate mailers and wields the most aggressive online presence. He also has the highest name ID having been a former member of the Orange County Board of Education and the current Orange Treasurer. Additionally, he has residual name ID from his wife, Lisa Woolery, a former member of the Rancho Santiago Community College District Board. Eric Woolery also dominates the endorsement arena, wielding the endorsements of the Orange County Taxpayers Association, the California Republican Assembly, and numerous elected officials. With tens of thousands of dollars, Woolery also has a larger warchest than all of his opponents combined with $50,200. He spent $38,701, on a combination of the ballot statement, candidate filing fee, slate mailers, campaign literature, and consulting fees. Davies spent his entire $16,476 on the ballot statement and candidate filing fee. Willard has $16,438, which was presumably spent on the ballot statement and candidate filing fee (he filed a Form 497, but not a Form 460); presumably the other $38 was wiped out by signatures-in-lieu. Benuzzi raised $2,400 from Anthony Benuzzi and Ronald Benuzzi but had to refund $200 to Anthony Benuzzi when they discovered they had exceeded the campaign contribution limit; with his remaining $2,200, he paid the candidate filing fee and $280 of campaign literature. Dalati did not file a campaign finance report for the January 1-March 17 reporting period. In the interest of full disclosure, Woolery is a client of Custom Campaigns, the consulting firm that owns this blog.